Captain Leviticus slammed the splintered remains of the wheel to port. The Ark’s masts groaned under the strain. “We’re getting close”, he screamed over the diabolical winds. “Fifth circle,” yelled the navigator, gazing intently into the orrery. Down below all the supplies rattled in the lockers; oil lamps flickered; a sulphur-laden mist seeped into every nook and cranny, making grown men weep tears of fear. “This is Mephistopheles’ domain”, yelled the navigator again. His shouts ebbed away into the crow-black night. On deck, the captain ordered the cannons to be readied. He knew not when the encounter would arrive. The Watchman and Protector dwelt in the fifth realm. “Load the silver shot — look sharp,” ordered Leviticus, squaring himself up as he did so. He squeezed his fingernails into his palm just to check he was still there and winced in pain. “Do not look down boys. We have a task and He must be vanquished. Must. At any cost.” Reply came there none: his men had sold their souls for some scraps of bread and eternal glory. The price of failure would be eternal damnation. Since Seraphim had last swept across the Over-World, the days had turned to nights. Each day there were more incursions. More and more demons were tearing open the thin membrane between the worlds. No more Archangels to guard the world of men. They were all dead long ago. Leviticus allowed himself a quick glance down from the deck to the boiling sea below. 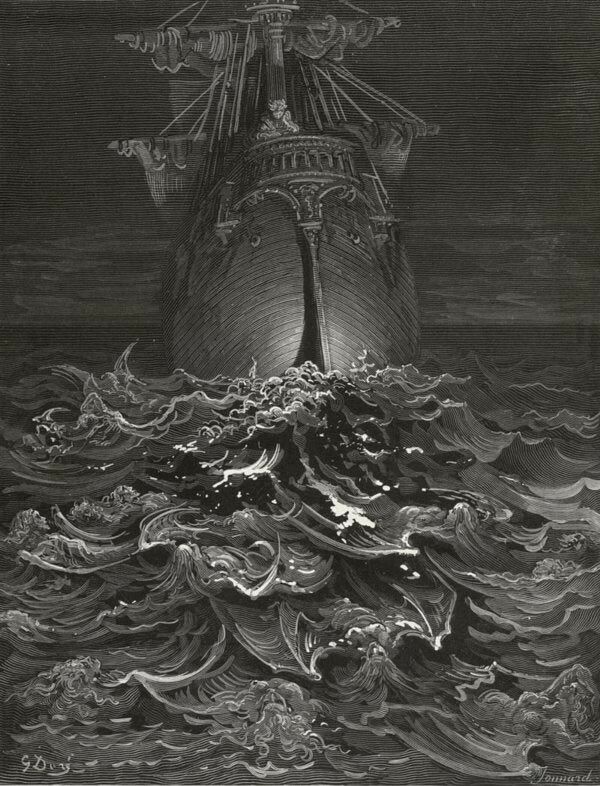 The fifth circle was close to Him — the sea a million, billion shape-shifting demons beating their skeletal wings against the yew and hornbeam of the Ark’s hull. As each took form it twisted its face around curses and howls of pain, then melting back into miasma. Tiny burning pinpricks stared up from the demons’ eyes at Leviticus and his crew. Down here there was no light. No heat. No fire. That part of the Under-World was long past, the realm of damned souls just beyond our own. Leviticus shuddered. The future of mankind lay on his shoulders, and on the thin planks of the Ark. He wasn’t sure either would withstand the punishment to come.